Albina du Boisrouvray created the organization FXBVillage to help rescue people from poverty. French film producer Albina du Boisrouvray was born into wealth and opportunity. She had a successful career in film and the arts. Then she married a successful and rich businessman. 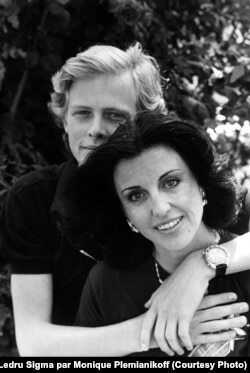 In 1986, her only son died in a helicopter accident in West Africa. He was 24. 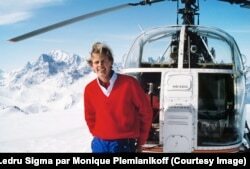 Francois-Xavier Bagnoud standing by a search-and-rescue helicopter. "He was a very dedicated search-and-rescue pilot and he lost his life at age 24 in a mission in Mali." His name was Francois-Xavier Bagnoud. He was a search-and-rescue pilot. His dedicated his life to finding and helping people who were in trouble. After her son died, Albina du Boisrouvray created an organization to fulfill his life’s work. She founded FXBVillage, named with his initials. The organization finds and helps people living in extreme poverty – people who are destitute, who do not have even the most basic necessities. "So when I set up this organization, I wanted it to take on his commitment to rescuing people on a large basis, and that's why I started with those children who were so destitute and the people living in poverty." FXB began in 1990 in Uganda. It started by helping children whose parents had died of HIV/AIDS. FXB invested in the children and the adults who cared for them so they could move out of poverty. Today, FXB works in eight countries that have some of the highest poverty rates in Africa, Asia and Latin America. Eighty to 100 families at a time are brought into the program – or "village," as it is called – for three years. In the first year, the families get free food, health care, education and housing. This investment allows the person making the money in the family – the breadwinner – to focus on building a business. FXB also buys items for the breadwinner. Maybe it is a cow, or farming tools or a sewing machine – whatever is needed to build the business. These purchases are not loans. FXB provides them all for free. "And so the second year they have made savings and they participate in the budget, about 25 percent, we invest 75 percent. Third year it's 50-50; the fourth year they are on their own." Albina du Boisrouvray says FXBVillage builds a family's ability to provide for itself. Over the past 25 years, the organization has helped lift more than 80,000 people out of poverty. The program costs only $125 to $230 per person per year. But the results are huge. And the success rate is very high. Eighty-six percent of families who complete the program succeed in getting out of extreme poverty. And they stay out. The people who take part in the program, says Ms. du Boisrouvray, are mostly woman and children. She says the experience gives them things that cannot be measured – feelings such as dignity and pride. "It also gives women, which I see, mostly women – and children, but mostly women, back their dignity, their pride, and it unleashes all their capabilities of creativity of work." When people are empowered, she says, they can help themselves and their families gain a better life. Margaret Besheer reported this story for VOA News.